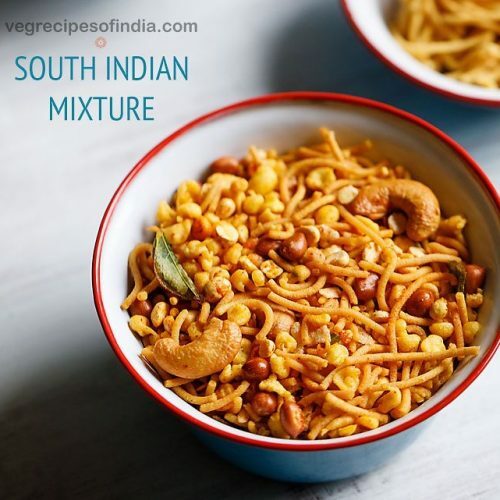 madras mixture recipe - one of the popular south indian snacks made during diwali is this south indian mixture, which is basically a mix of various edible ingredients, nuts and dry fruits. it is also called as omapodi mixture. grind to a fine powder. keep aside. you can even crush ajwain in a mortar-pestle. in this case, when adding ajwain, use a tea strainer and sift the ajwain powder through it. this is done so that when pressing through the sev maker, the dough strands do not break. then add 1 generous pinch asafoetida (hing), 2 pinches turmeric powder, ¼ teaspoon red chilli powder and 1 teaspoon salt. you can add salt as per taste. turmeric powder can be skipped. for a spicy omapodi, you can increase the amount of red chilli powder. for more crispiness you can add a pinch of baking soda also. mix very well with a spoon or spatula. now heat 1 tablespoon oil in a steel bowl or a steel measuring cup. knead to a smooth dough. if the dough becomes sticky, then you can add some more besan. if the dough looks dry, then add some more water and knead again. cover the bowl. let the oil in the kadai become medium hot. check the oil temperature by adding a small tiny piece of the omapodi dough. if the small piece of dough comes up gradually and steadily on top, the oil is hot enough to fry. if it comes up too quickly, then oil is too hot. if it settles down at bottom of kadai or comes up very slowly, the oil is not hot enough for frying omapodi. when the oil is hot enough, directly press holding the sev maker on top of the oil and let the sev directly fall in the oil. while pressing rotate in a concentric circle from the center to outwards similar to making a chakli. do not over crowd the kadai with omapodi. add as much as needed without overcrowding the kadai. be careful when pressing the sev in the oil. after the sev is pressed in the oil, break the top sev strands with a spoon or knife and let the sev strands fall in the oil. gently begin to turn with a slotted spoon. now fry the second side. you can turn over a couple of times for even frying. when the oil stops sizzling, continue to fry for some more seconds till the omapodi are golden and crisp. turn over as needed when frying. do not break the sev while frying as then it becomes extra work to remove the small pieces of sev from the oil. so fry the entire round shaped omapodi as one piece and do not break it. when the omapodi are cooled, then place them in an air tight container or box. break omapodi before adding in the mixture. take ½ cup besan (gram flour) and 1 tablespoon rice flour in a mixing bowl. then add 1 pinch asafoetida (hing), 1 pinch of baking soda, 2 pinches turmeric powder and ½ teaspoon salt. now add 8 to 9 tablespoons water in parts. using a wired whisk make a smooth and slightly thin batter without lumps. the batter consistency is slightly thin. the amount of water to be added depends on the quality of gram flour. so add accordingly. heat oil for frying in a kadai or pan. when the oil becomes hot, then tap the wired whisk or the handle of a spoon which has a bit of batter in to the hot oil. now take a dry perforated ladle/jhara and place it above the hot oil. don't keep too much on a height, as the batter droplets, when falling from a height, do not give a round shape. with a spoon add some batter on the perforated spoon ladle/jhara. spread the batter lightly with a spoon. finish up the batter on the perforated spoon ladle this way. on a medium flame begin to fry the boondis. do not turn them. let them become slightly crisp and then turn them. when the boondis have become crisp, turn them with a slotted spoon. you won't get perfect round shape for each boondi, but it does not matter as the taste of homemade boondi is better than store brought ones. after the oil stops sizzling, continue to fry the boondis for some more seconds so that they become crisp. remove with a strainer spoon or a slotted spoon draining the extra oil. place the fried salted boondi on kitchen paper towels. after each batch, wipe the perforated ladle/jhara with a clean piece of moist thin cotton kitchen towel from both sides. continue to fry boondis this way. once the boondi cools down, store in an air tight jar or box. when the boondis are frying you can remove and keep everything ready for the next step. use a fine sieve ladle as shown in the pic below for frying. in the indian markets we get these sieve with a handle. this sieve ladle is very helpful for frying ingredients which have small pieces or flakes. as you don't waste time and energy trying to find out the rice flakes or the chana dal in the oil. take the peanuts first in the sieve. immerse in the oil and begin to fry. with a spoon stir often while frying so that the peanuts are fried evenly. fry peanuts till they are crisp and crunchy. using the same seive drain the extra oil. so this ladle is helpful for frying as well as for getting rid of extra oil after frying. place the fried peanuts on kitchen paper towel. then take cashews in the same ladle. stirring often with a spoon fry cashews till they are golden. place the fried cashews on the same kitchen paper towel. next take roasted chana dal. stirring often with a spoon fry roasted chana dal till they are crisp. frying chana dal will take some seconds and their color will change. place the fried chana dal on the same kitchen paper towel. stirring often with a spoon fry poha till they are crisp and pale golden. don't brown the poha. i have used thick poha. you can also use thin poha. once the poha is fried well, then drain off the extra oil using the same ladle. place the fried poha on the same kitchen paper towel. next add curry leaves. stirring often fry curry leaves till they become crisp. curry leaves take a few seconds to fry. place the fried curry leaves on the kitchen paper towel. in a parat or a large bowl or tray or plate take 2 cups of the omapodi and 2 cups of fried boondi. remaining omapodi you can serve as a snack. with the remaining boondi, you can make boondi raita. you can also take more if you want. add the fried nuts, poha, chana dal, curry leaves. add ½ teaspoon red chilli powder, ⅛ teaspoon asafoetida (hing) and salt over the fried chana dal, poha, nuts and curry leaves as they will be still hot. mix well with a spoon first and then later you can mix with your hands. then place the mixture in a jar or container. store at room temperature. serve south indian mixture as a diwali snack or a tea time snack.